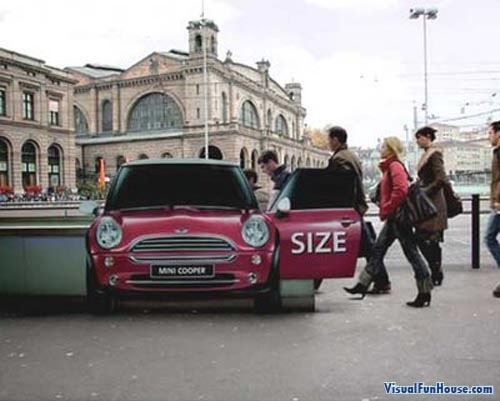 Mini Cooper Clown car Advertisement Illusion is a cute advertisement showing how big mini coopers really are! This cut out add has been put up at the entrance to the train station in Zurich , Switzerland. 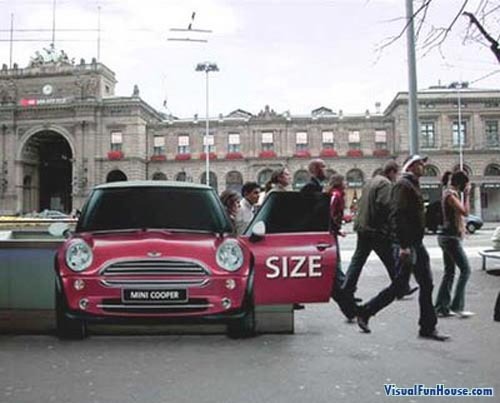 This illusion makes it look like the mini’s has a huge area and you can pile in as many people as you want. much like the good old cartoon clown cars 🙂 So pile in and lets take this mini for a spinny! you can see its on a cut-out and the people are going up and down stairs. Lame but definitely good ad space.